The future of education will see an increasing role of virtual and augmented reality in and out of the classroom. New technologies, like virtual and augmented reality, will shape the way new generations work, have fun and learn. 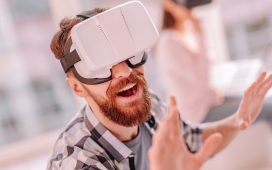 AR and VR are already leaving their mark in education and changing the way teachers and students interact with each other and with the subject matter. But this will not stop at a few experiments here and there, a few new learning and grading tools. Virtual and augmented reality have the capacity to transform teaching and learning experiences, to make them more relevant, inclusive and interactive. A well known piece of writing advice given by celebrated American novelist Mark Twain states: “Don’t say the old lady screamed. Bring her on and let her scream.” This piece of advice is also very useful in the classroom. Children have a notoriously short attention span. Reading about historical events or chemical reactions is often boring and disconnected. Having to learn something by heart is even worse. The students will remember the words for a short time (until they earn the passing grade) and then forget them, but they will never grasp the concept behind the word. Using augmented reality to bring to life situations, events or natural phenomena is more effective in capturing a child’s attention and helping them remember what they saw that one thousand words. Interactive learning is also beneficial for students with special needs, such as dyslexic students. Having the chance to experience what they are learning about will also work wonders for children who are slower at memorizing or lagging behind in a traditional classroom setting. When a shy or special needs student meets their peers in a regular classroom, they tend to fade to the back of the room and get involved very little in group projects. But when the project and the collaborative work take place in a virtual reality environment, things are different. The holographic environment gives them a sense of confidence and excitement and they can reach their top potential in projects and graded tests. It is pretty much out of the question for most teachers to take their students to actually see the Greek Acropolis or the sites of significant historical events. Long distance and the fact that many historical sites no longer exist, are the key impediments. But virtual reality can effectively remove them. Rebuilding a temple, the landscape of 3,000 years ago or anything similar as 3D models is easily achievable thanks to the advancements in new technologies. Instead of using words and letting students picture these places as far as their imagination allows it, teachers can invite them to put on the VR headsets and start on an amazing journey of discovery. A lot of things can go wrong during a practical experiment in the chemistry or biology class. Incomplete understanding of the task or a wrong move is sufficient to cause a dangerous reaction which could hurt students. Using augmented reality, students can interact with holographic items, try and fail as many times as it takes without any real life consequence. This will make classrooms safer for everyone and, at the same time, stimulate the students’ curiosity to try various scientific experiments. Too much theory and too little practice creates a generation of brilliant youths with little hands-on job skills. Training skills requires extra space, extra equipment and materials and this would be a financial burden both for schools and for students’ families. With virtual and augmented reality, students can work with complex 3D models, simulate real life situations and work procedures using only a headset, a smartphone or a computer and a dedicated application.